Again this is a tough concept to illustrated especially when preschoolers will be using this printable. We err on the side of positive for these. Parents can elaborate as needed. 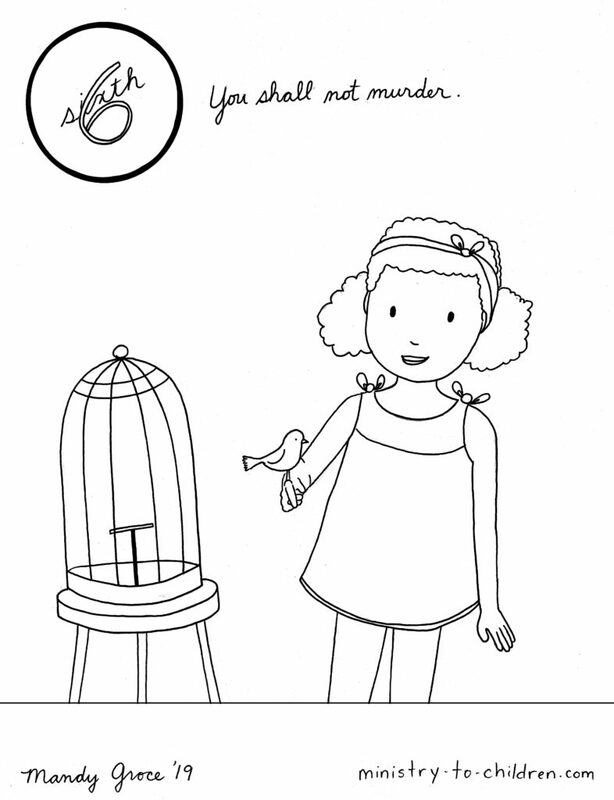 My thoughts for the 6th were that the little girl is caring for the life of the bird, rather than endangering it. This is inspired by Exodus 20:13. For most kids, protecting and taking care of life is the simple application. In our simplified 10 Commandments we write “Do Not Kill People” but this illustration brings out the broad lesson. In this command, God requires us to respect life. This means avoiding the unnecessary taking of life and the protection of life. This is how Christians have typically applied the principles of these commands to all of life. Tony Kummer (Editor) reviewed & updated this page on : March 21, 2019 at 12:51 pm. All our content is peer reviewed by our readers, simply leave a comment on any post suggest an update.